January 3, 2006 0800 PST (FTW): My neighbors, who are great friends and good people, are collecting fallen tree branches in the woodland preserve that borders our block to reduce their heating bill. They were unable to secure a good supply of wood this year since they work long hours six days a week. Their house is heated with oil but augmented by a wood-burning stove. Wood burning insert installed in an already existing fireplace. With 423 acres, the preserve is one of the largest in the County, and is home to over 100 species of plants and animals. The population of all the bordering towns totals at least 100,000 people. Scavenging for fallen branches is not illegal so long as it goes no further than that. Cutting living tree limbs is not allowed – but imagine what might happen to this preserve when fuel shortages and a shattered economy become our daily reality. Previously my neighbor was bringing in a wood supply from Eastern Long Island by van, but he has recently determined that it was not an efficient enough system to continue this year. He is left with all of the necessary gadgets – including a $2,000 hydraulic wood splitter – but no wood. The easiest solution for an overworked family that wants to trim their heating bill is to scavenge, since the preserve is so close. What is remarkable is why my neighbors are inclined to scavenge. This past summer their entire family went on a European vacation that cost more than $20,000. The savings they hope to obtain by burning firewood will allow them to burn more jet fuel. Something is terribly wrong here. This is, in part, why FTW has such a pessimistic view of current events as they unfold. Split wood stacked on rack covered with tarp to keep dry. The concern is not to ration fuel supplies ethically so the poor won’t freeze to death, but rather to maintain as much of one’s own personal wealth as possible. There is nothing inherently wrong with looking out for your own interests, but will we ever realize that the coming struggle is communal and not individual, or will we keep wasting resources in search of a distant happiness that will never be found? If my well-to-do neighbors are scavenging, there must be at least five other families here doing the same, if not more. 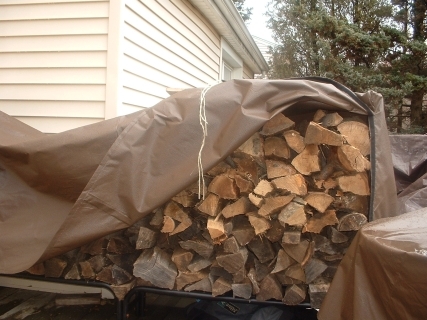 Securing firewood on Long Island has traditionally been easy and inexpensive – often free. While suburban sprawl has many problems, a lack of trees is not one of them. Branches grow as they please, getting in the way of power lines and rooftops. Curtailing overgrowth, along with tree removal, has long provided more wood than is needed for the stoves and fireplaces on Long Island. In one day, a tree trimmer can accumulate thirty yards of wood. Often he has to pay a garbage dump to dispose of it, which has made a great situation for those who buy firewood. Company’s such as Asplundh, who hold contracts to trim trees that interfere with power lines, season and split as much wood as they can and sell it cheaply since they have converted waste into a profit. After this winter there will likely be an entirely new economic rank for firewood; prices this year were already higher than usual. 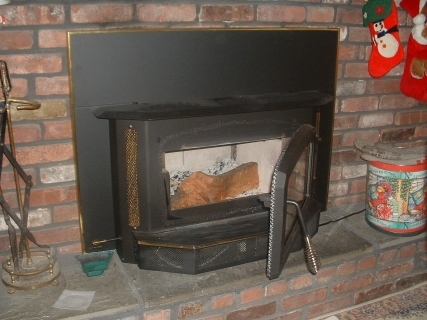 Immediately after Hurricane Katrina I purchased a wood-burning insert for the fireplace in my home. Most of the heat produced in a hearth rises up and out of the chimney. Without the vigilant use of a flue, the heat gains of a fireplace can be quickly deplete from the room, even to the point of net heat loss over time. But with my new insert, I was able to convert a net-energy loser into an efficient 75,000 BTU heating unit. Total cost was $3,000 including installation. The fall was spent acquiring, splitting, and stacking firewood. Driving past a house in my neighborhood I saw a stack of freshly cut wood that looked great to season for next year. I borrowed a friend’s van and set out to ask the owner of that woodpile if I could take the wood of his hands. By that time it was gone – someone else had beaten me to it. There was almost a cord of wood left over from last season in my backyard and about half a cord of unsplit wood. We purchased two more for a total of $280 – the cheapest we could find. For that price the wood was dumped on our driveway; stacking was not included. Our insert can hold 18” logs, but much of the wood we had just purchased was longer. It took 12 hours to stack the wood, starting with logs that were 18” or less, and the rest was piled high in the backyard to be cut to size with a chainsaw. With two men cutting and stacking the rest of the wood (with the hydrocarbon benefit of a chainsaw) another full day of work was invested. We are already concerned that securing a good wood supply next year at a reasonable price will be difficult. Demand is soaring as more people purchase wood-burning heating systems to supplement their oil or gas budget. The sight of a neighbor (who isn’t poor) already wood scavenging before any real fuel crisis has arrived is not a promising indication of what is to come. This may very well be my last winter in suburbia. 1 I am not interested in producing many kilowatts of electricity from solar panels since this will induce a false sense of energy security: renewable energy sources must be used within a sustainable construct that is the antithesis of suburban sprawl. The home must stay warm, but televisions, lights, computers, and other appliances can be turned off.